HorrorAddicts recently had the joy of interviewing Jill Tracy about her music, inspiration and some of her achievements…..
JT: As far as bands go—most definitely Pink Floyd. They captured that cinematic mood, that dark, mournful beautiful devastation that transported you completely. Also Led Zeppelin, The Cure, David Bowie, T. Rex, early Elton John, The Doors, Japan, later period Talk Talk, The Pretenders, Gang of 4, Psychedelic Furs, The Cult, Roxy Music, The Who, early Peter Gabriel, old Moody Blues, early Aerosmith and Black Sabbath, ahhh, so many! It was only after I began performing live that I became acquainted with more of the classical composers, oddly enough because I was always getting compared to them. My very first-ever review in the 1990s (Bay Guardian) described me as “Erik Satie meets The Cure.” And later it was a fan who compared my mysticism to Alexander Scriabin. I am forever honored that my work is resonating with people in that realm. JT: I have always been drawn to the mysterious— fantastical, otherworldly imagery. Worlds sans-time. I was obsessed with Alfred Hitchcock, Bernard Herrmann, Ray Bradbury, Rod Serling, Jean Cocteau. As a child, I tried to build a time machine in my bedroom closet. I thought one could travel through the shadows. I just wanted to live in those worlds. I read about time travel, the belief in other dimensions, spirits, ghosts—I would lecture to my stuffed animals about the solar system and constellations. All I wanted to do was to discover or manifest hidden worlds. I knew they existed. My mission was to figure out how to find them. I began making frequent visits to an lderly widow who lived next door. Her home was encrusted with bric-a- brac, old photos and dolls—porcelain-painted Siamese cats with jewels for eyes. In the basement was an ancient upright piano, covered entirely in beige and gold-flecked paint. It sat next to the washer and dryer, under buzzing fluorescent lights. There was something atrocious, yet reverent about this thing. It kept calling me. I knew nothing about the instrument, but I kept venturing next door, poised on the golden bench for hours, letting thoughts and spectres rush through my fingertips, as it transported me far away. I didn’t know what I was doing– but didn’t want to do anything else. This became my portal. It still is. To this day, I don’t read or write music, it’s all intuited. JT: I’ve learned to channel music spontaneously via various energy sources, whether found objects, environments, etc. The Musical Séance is a live traveling show, my long-time collaboration with violinist Paul Mercer. It’s a collective summoning driven by beloved objects the audience brings with them. Items of personal significance—such as a photo, talisman, jewelry, toy. This is a very crucial part of manifesting the music. Every object holds its story, its spirit— energy, resonance, impressions from anyone who has ever held the object, to the experiences and emotions passed through it. These compositions are delicate living things. They materialize, transport, and in the same second— they vanish. That’s the amazing thing about The Musical Seance— you never know what to expect, and each experience is entirely different, extremely emotional, for us, as well as the audience. It creates this rare synergy with everyone in the entire room. Often, the curiosities themselves are just as compelling as the music they inspire. We’ve encountered everything from cremated cats, dentures, haunted paintings, 16th century swords, antlers, x-rays, gingerbread man, a lock of hair from a drowned boy. But one thing I’ve learned is––everyone in the world has a story to tell that will break your heart. JT: It literally translates in “clear-hearing.” As with clairvoyance, which means “clear-vision,” being clairaudient means the ability to hear things not of this world. I have always heard strange unexplained music. Often heavy and harsh, but compellingly exquisite, alluring, complex. I can’t even begin to describe it! It maddens me that there is no way that I could ever harness it to compose or record. It’s beyond anyone’s grasp. For the past few years, I have begun to hear people’s voices talking, it’s usually very urgent and fast, like they need to relay a message. I do believe in simultaneous realms, and that we have the ability to share a frequency, be an antenna, if sometimes only for a second. It’s a mingling of Time. I’m learning more about harnessing this gift, it plays such a key role in my ability to find hidden musical scores when I compose in unusual locales. I used to be leary of it, but now find it strangely comforting. JT: It’s really about finding the quiet, so I can be fully receptive, like an antenna as I mentioned before. The Soul lives in the silence. You must be able to tune out to to truly tune in. Unfortunately, these days of on-demand, constant world-at- our-fingertips connection has destroyed our sense of mystery and childlike wonder. That breaks my heart. Monsters, marvels, lore, and legend—these are the things that make us feel most alive. Now there is so much constant NOISE—we think it enriches us, adds something, but really it is soul-stifling. We’ve lost our own identities inside the din. The Internet is a blessing and a curse. The ease to obtain information and connect with the world is glorious. But at the same time it’s destroying our individuality. Everyone is getting their news/views from the same sources and absurd algorithms, not looking outside, or challenging themselves to think further. We’re trapped in a giant echo chamber. There has never been a greater need to venture outside the cage, to seize our truth and authenticity. To be an individual now takes a great deal of effort. But so vital! JT: My life’s work is about honoring the mystery…One of my greatest pleasures of late has been immersing myself alone in unusual locations, or a place with a strange story, and composing music as a reaction to that environment. The intense purity and immediacy is so exciting. You are hearing my raw emotional response at the piano. I’ve found myself conjuring the hidden score in decrepit gardens and cemeteries, on the antique Steinways of the (supposedly haunted) Victoria B.C. 1890 Craigdarroch Castle, an abandoned 1800s San Francisco medical asylum, and the Los Angeles mansion of a 19th century murderer. The lovely and difficult thing about this work is that I can’t prepare for it, as I never know what to expect. I must allow myself to be completely vulnerable; simply feel, and react. It’s not about me anymore; it’s about the music, the story. It becomes so much bigger than any of us. That’s the beauty of it. 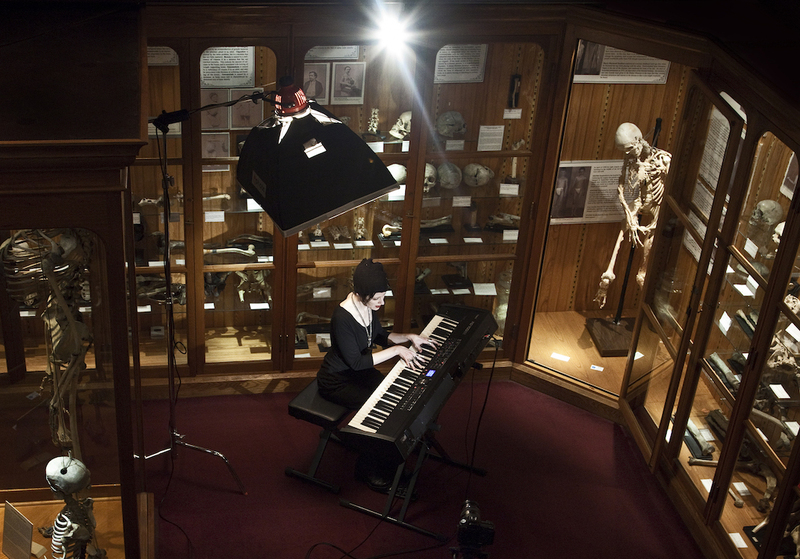 My huge dream-come- true is that I am first musician in history to ever be awarded a grant from Philadelphia’s famed Mütter Museum, to create a series of work inspired by its spellbinding collection of medical oddities. 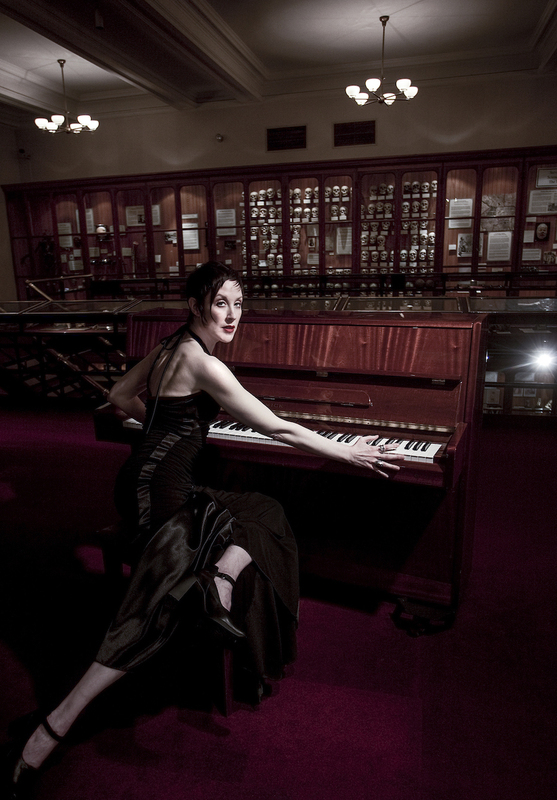 I spent nights alone at a piano amidst the Mütter’s grotesque cabinet of curiosities, which includes the death cast and conjoined liver of original Siamese twins Chang and Eng, the skeleton of the Harry Eastlack “the Ossified Man,” Einstein’s brain, The American Giant, books bound in human skin, and the Mermaid Baby. It was vital for me to be in the presence of these long-lost souls, as I composed and recorded. They become an actual part of the work and not just the subject matter. The project will include not only a music album based on the Mütter collection, but also an art book and memoir of my chilling experiences inside the museum after dark. All of my work will be factual. I’m done extensive research at the museum, even utilizing excerpts from letters and doctors’ records. I began this project in 2012, and have become completely swept up in the research. JT: This is a great question! People always ask me if I got scared inside the Mütter Museum alone in the dark, or if I get frightened when channeling music in a cemetery, asylum, etc. The answer is no. I am completely immersed in that moment— it is a feeling of hyper-realism. Being fully alive. Super-charged. It’s that same feeling when I’ve acted in classic Grand Guignol plays (famed Paris Horror Theatre 1897-1962.) Letting yourself be completely terrified onstage is a strange, exhilarating catharsis. Screaming at the top of your lungs in front of an audience is profoundly liberating. I’ve died onstage in many bizarre ways: Torn apart by a savage wolf boy, killed in a violent train crash, leapt off a balcony to my death, hypnotized by a mad scientist, locked in a castle tower with a demon, etc— The underlying thing is you know in your soul, underneath the fake blood and the layers of prosthetics and costumes, that you are going to be okay. BUT—I have been in some quite scary REAL-LIFE situations. I was in a near plane crash, as the airplane’s brakes went out. We had to prepare for an emergency landing on a foam-covered runway, hoping to slow down the plane. We had to remove all jewelry, belts, sharp objects, hold a pillow over our head, eyes closed, as we bent over our lap awaiting possible impact. I remember passengers screaming and sobbing. I was also mugged at knifepoint in a New York City subway alone at night. I instinctively ran after the mugger shouting within the empty concrete labyrinth. As I rounded a corner, he grabbed me. I was almost kidnapped in Paris by a strange man with pink hair and his two accomplices who locked me in the back room of a restaurant. I have discovered 3 dead bodies in my lifetime, in 3 different situations. In the midst of this real terror, your brain locks into that fight or flight mode— no time to feel afraid, you just do what you need to think clearly and get through it! JT: I prefer the chilling, classic psychological horror, over the slasher-gore fest. For me, it’s all about the story, getting drawn in, and the fear of the unknown. (Our imagination is truly the scariest component of it all.) There are many great movies, but these come to mind: Eyes Without A Face (1960), The Birds (1963), Rosemary’s Baby (1968)—also Mia Farrow in the great lesser-known thriller The Haunting of Julia (1977), Invasion of the Body Snatchers (original 1956), Mad Love (with Peter Lorre 1935), The Sentinel (1977), The Shining (1980). JT: I’m currently writing — resuming work on the Mütter Museum book and music project, as well as other new songs. I just began a lovely hibernation from live gigs to focus on creating again. I am also designing what will be a subscription-only series called The Noctuary (inspired by my love and lore of the Night,) which will feature exclusive music, videos, stories, private concerts, behind-the- scenes interviews, and more for subscribers only. I am excited to reveal the details! Please sign up to my inner email circle at JILLTRACY.com and you’ll be first to be invited to join The Noctuary! JT: I have 5 full length albums, plus various film scores, and singles, even a Christmas album— my dark classical interpretation of some of the more haunting old carols. Definitely the holiday collection for people who prefer The Dark Season. As an intro to my work, I would start with albums The Bittersweet Constrain and Diabolical Streak. HA: What is the website we can find it on? JT: I offer some exclusive titles on my site unavailable on iTunes, Amazon, and other corporate shops. Plus no middlemen taking money for nothing. HA: What is the best social media site for listeners to connect with you on?